It has never been easier to track items for your family or business using a smartphone than the simple to use TRAC>DOWN tracking systems from DGPS4U. We know the value you place on your property, personnel, vehicles and loved ones. With our simple app on your phone or computer you can gain instant peace of mind, knowing the exact location of your children, elderly, staff or vehicles. Fleet Tracking - including Driver Behaviour Systems. 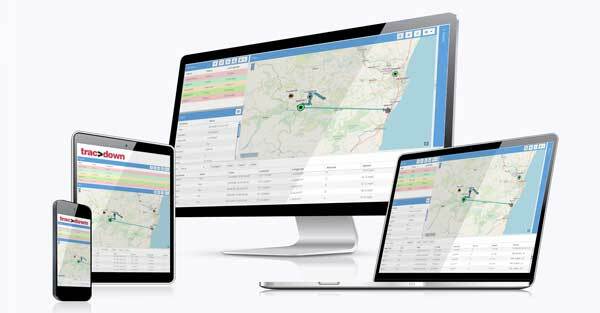 If you have a tracking solution requirement that requires an affordable and technically advanced software application then TRAC>DOWN is now your option of choice. Simple to operate via the TRAC>DOWN website or a quickly installed app it is available for both iPhones and android mobile phones. We can provide fitted hard wired/magnetic solutions or supply only with full instructions for quick installation into all types of vehicles. Getting operational couldn't be simpler - insert a Sim card of your choice, supply us with that mobile number and it is instantly uploaded onto the TRAC>DOWN website. We then issue you with a secure personal password and login details and then you are good to go! TRAC>DOWN is cost effective and very affordable with each unit based on a free 1-year subscription. Once connected to any mobile network our unique software allows you to track and pinpoint the precise location of the smartphone in question - anywhere in the world! The TRAC>DOWN app provides you with many other benefits including checking the location history of each device through to operating in the background without any indication of running - it automatically operates every time that the phone is restarted without giving any tell-tale notifications on the unit. Simply purchase the 1 year subscription for each device then we will send you full instructions on how to download the app and how easy it is to get started right away. Need more information on the TRAC>DOWN tracking systems? Call us today on +44(0)1339 883361. ** Please note that the TRAC>DOWN requires a network connection to operate, TRAC>DOWN holds no responsibility for the integrity and availability of a mobile network supplier. TRAC>DOWN supports most protocols and GPS Tracking Devices in the market. Modern fully-featured web interface with both desktop and mobile-friendly layouts. We also provide native mobile apps for Android and iOS platforms. TRAC>DOWN enables you to view your GPS devices in real-time, with no delay. We offer various mapping options, including road maps and satellite imagery. Our large capacity server manages a wide variety of sensors and additional information supplied via GPS units. Our software provides you with instant web notifications or email and SMS reports. Warning you immediately of important issue including harsh driving behaviour, speeding and excessive fuel and maintenance events, geo-fencing, and many other types of alerts. Simple location history, trip, chart, and summary reports. You can view data directly on the web or mobile app and export and download an Excel file. History can also be projected on the map providing a detailed visual representation. WATCH THE TRAC>DOWN DEMO VIDEO NOW!